A new day and a new state! 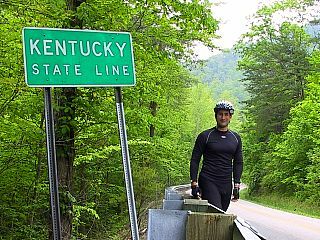 Since I was camped right on the border of Virginia and Kentucky, it was a short ride to the state line and the Bluegrass State. I didn't really expect to notice an immediate change when I entered Kentucky, but right away I noticed that my route was lined with honeysuckle and the sweet smell thereof followed me through much of the morning. I also noticed that the number of dogs barking at me seemed to increase dramatically, and that the sound of barking dogs was frequently joined by the sound of roosters crowing. More and more of the houses I passed would have dozens of roosters penned in their front yards, and I wondered if I wasn't in one of the states where cockfighting is still legal. It was apparent that the part of Kentucky I was passing through wasn't as wealthy as that of Virginia I had just left behind. The quality of the road surface diminished, the frequency of junked cars increased, and a constant ribbon of litter began to cling to the side of the road. It was almost as though where Virginia had declared "Welcome", Kentucky seemed to be saying "I wasn't expecting you until tomorrow!" My ride for the day had three long climbs, each followed by a long descent. During my second descent of the day I heard (again) the telltale sound of another broken spoke. I pulled over in a flat part of the road and found I had a snapped spoke on the cassette side of my rear wheel, which is the hardest location to replace a spoke. I wasn't really in the mood to take the time to replace a spoke then and there, so I decided to try the carbon-fiber temporary spoke I brought with me. Installing the spoke went smoothly enough, but when I went to tighten the spoke to the proper tension I ended up tightening it to the point that it punctured my tube. I guess I need more practice at this. Since I now had a flat tire, and since the carbon-fiber spoke trick hadn't worked the first time, I went ahead and repaired everything the right way. This meant removing the gears from my rear wheel to replace the spoke, retensioning the spoke, and patching the leak I had put in my rear tube. After putting everything together again I found that my tire promptly went flat again. The patch I had applied hadn't completely taken and needed to be replaced. Eventually I did get everything the way it should be, but I easily spent over an hour by the side of the road that I would rather have had free to me in the evening. My destination for the evening was the Pippa Passes Hostel, which is located right next to the small Alice Lloyd College here in the Appalachians. I made it to the Hostel around 7:00 and wasn't here for more than an hour when the rain started falling outside. It is supposed to rain through much of the night, but I've still got a shot at clear sky tomorrow. Ah, yes. Some of the finest parts of the country. Or, as Ned Beatty says "SQUEEEEL"! Hi Nick!! You're doing great! God, I wish I was riding with you! I just caught up on all your posts -- terrific stories! Barb & I are looking forward to seeing you again when you get to the Pacific NW. I'll be on a tour myself out here from Aug 10-19, but will otherwise be around. We can pick you up in Astoria and bring you home with us to a hot shower, good food and warm bed. I hope you get this post, if not, I'll be keeping up with your entries. Call us when you get close!